I’ve been waiting for over a month for the new batteries to be delivered. It’s a good thing because it has given me more time to think about how to go about upgrading and modifying the entire electrical system. I like to call it a spaghetti factory but it isn’t really that bad. 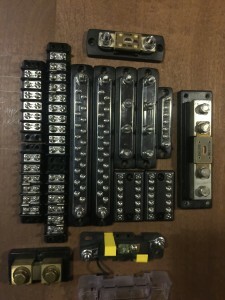 All of the DC components on board have inline fuses and are wired to a circuit breaker. The AC system is lacking it’s own independent breakers but there is one right at the end of the shore power cable on the dock. The existing system could keep working by just swapping out the golf cart batteries every couple of years. So why replace everything? 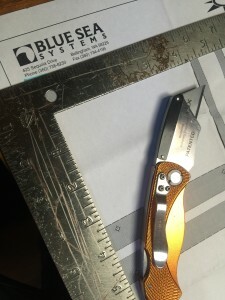 Mainly because the cost of the replacement, the fact that I can do it myself with wisdom from several reliable sources, and also because it is winter and I have plenty of time to get it done right. Once it is completed I will be able to add several other components in the near distant future and the new electrical system will be ready for them. 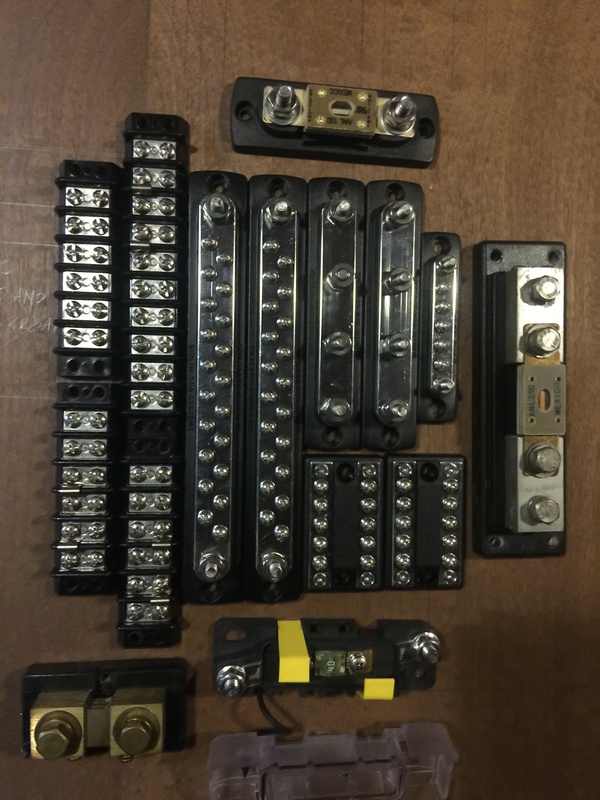 All of the components will be on a very safe and dependable circuit. I can live off the grid for potentially weeks at a time without ever starting the motor, enjoying comforts like refrigeration, hot water, push button toilet flushing and lots of fans circulating air in and out of the cabin. Every wire around the entire boat has been traced. Each one meticulously labeled with either a positive or negative and name, e.g.- “big bilge pump +”. Some components are removed and wires bundled away from the switch panel. Everything except what I need to continue living on the boat has been removed from the 12 volt panel. I need to first remove the starting battery and clean up the wiring so I am close to a clean slate as possible. 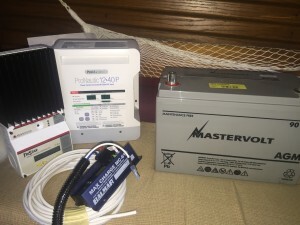 The old ACR, battery monitor and voltage regulator can be removed and only the wiring for AC and charging the old bank will be left over so over a weekend I can install new AC and DC panels, then wire up the bare minimum for being able to live on the boat. Once the minimum components are installed, I’ll install the new batteries. Then each component will be meticulously programmed, tested and permanently installed. After everything is installed and working again I will replace any suspect AC and DC wiring and then secure the entire circuitry. It’s difficult to tell how long this phase will take. It took a year and a half just to get to this point, where I know the boat inside and out. 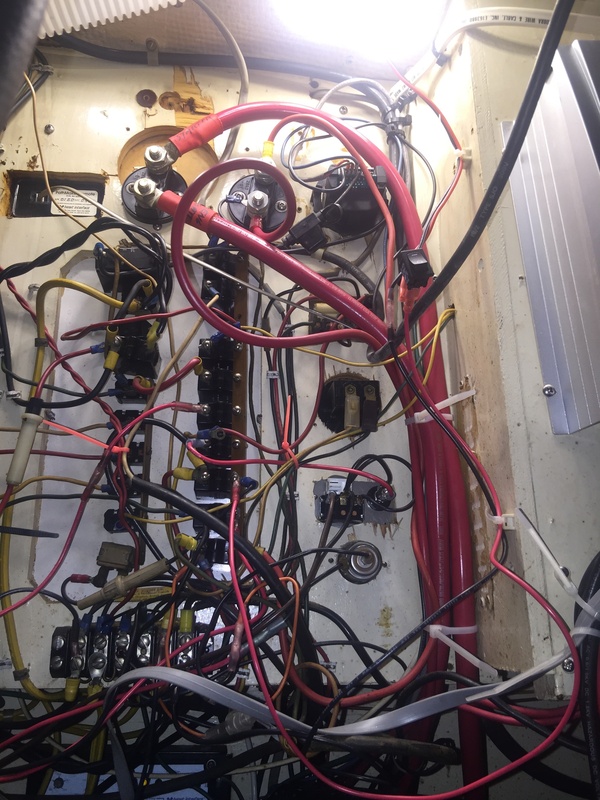 To understand an entire electrical system of your offshore cruiser is essential to being able to troubleshoot any issues quickly and easily. I built the system so now I know how to keep it tuned and working well. 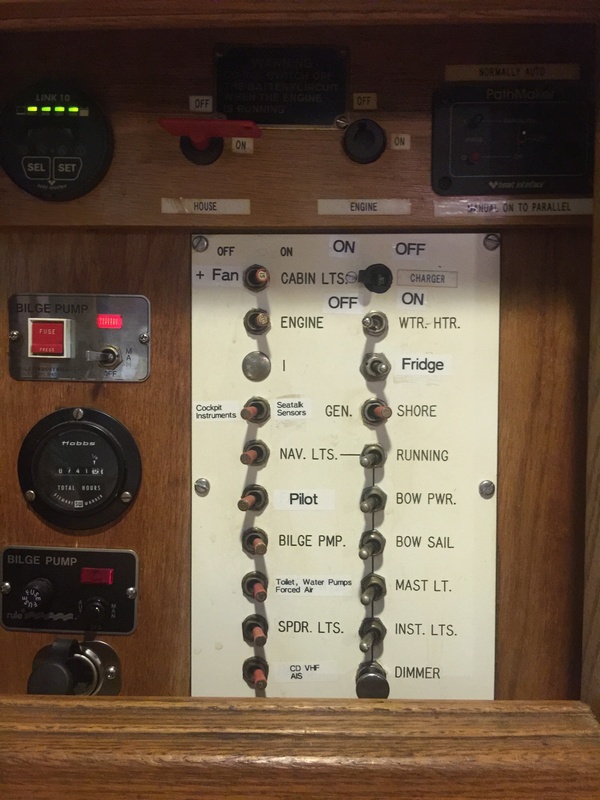 There are two projects in parallel at the beginning of the project; one is removing old circuitry and replacing wires that can be replaced without compromising the cabin in any way, and the other is rewiring with duplex from the components back to the panel. Some old wiring cannot be replaced because they are located inside of the mast or headliner so where they are accessible is where new wire is spliced and led to the new panel. The wire is then bundled together using zip ties and tie holders against a surface to prevent dangling or movement and eventually chafe. 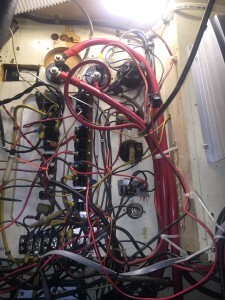 Another project that had me side tracked is getting the wiring out of the bilge. There was once a group of wires that ran under the cabin sole but since I’ve decided to upgrade the electrical system, I’ve also decided to reroute the new wiring a few feet from the cabin top and then bring it down to the DC components. 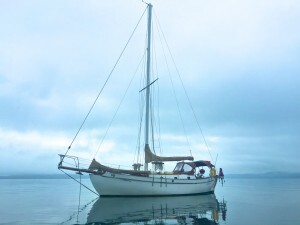 I hope the bilge never fills enough to go above the cabin sole but if it does, having seawater contact the electrical circuit would be mitigated so to me it seems like a logical choice while undergoing such an endeavor. 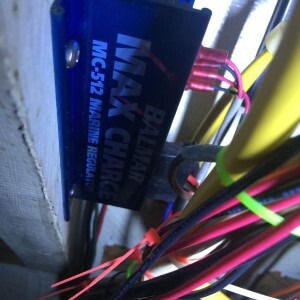 The replacement wiring will also handle much higher amperes than the previous install so voltage drop will be less of an issue and the system will run safer and more efficiently than ever before. An important part of the new wiring for the stove and hot water system is a circuit that will automatically switch on the forced air heater and water pump in the event that the stove raises the glycol temperature above 200 degrees and bring it back down to 180 degrees. The normal hot water temperature usually ranges between 100 and 140 degrees so this is just a failsafe measure to prevent potential damage to the hot water tank and pipes. In order to allow the pump and stove to have their own independent bypass switch, they require a blocking diode so current can be fed through the thermostat to power the components but if one of the components is on using a bypass switch, current isn’t feeding back into the other component. I will post something later on this subject. It’s been fun designing this heating system. A big challenge to this project has been living aboard while disassembling the electrical system. The batteries are removed and the circuit panel is down to the bare essentials to keep the important electronics operating. At one point I had to connect the battery charger directly to the DC panel and set the charger to constant float so I could remove the old battery bank. Not ideal as it does not provide much current to the toilet macerator, but it works for the time being until I have a new battery bank installed. When I ran the new wiring to the bathroom and forward berth I had to empty all of the port side lockers so I could feed wire without obstructions. What was once an organized boat then became a storage place for all of the electrical wiring and components until they are all installed. The lockers had loose wiring until it was time to secure the entire bundles. Every day the amount of stuff cluttering the living space is reduced, based on what is accomplished that day. Plenty of incentive to keep working on whatever I can until this project is completed. Once the new DC wiring was in place, I was able to move on to the panel installation. 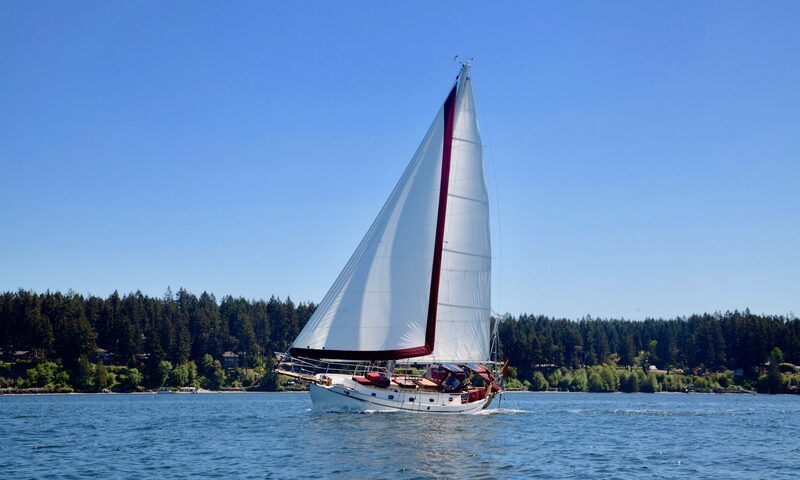 First I had to locate a suitable piece of plywood that matched the beautiful hardwood already on the boat. 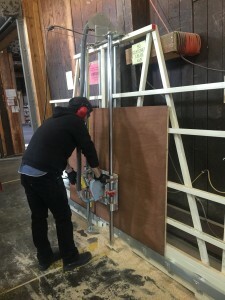 Luckily we have a place in South Seattle called Crosscut Hardwoods that has a great selection of exotic plywoods so I sourced a five-ply 6’x4′ of mahogany. 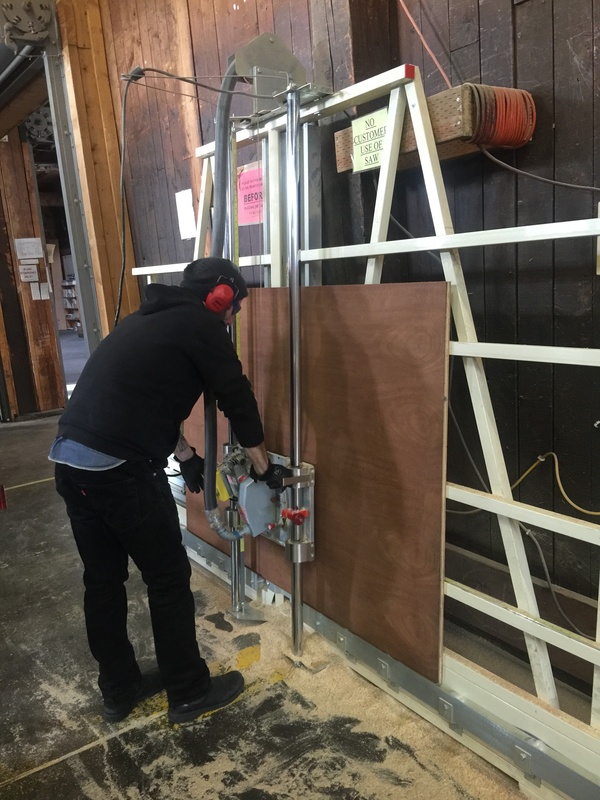 Then I needed to cut and size the new piece to fit into the locker, which luckily a friend offered to help out using hit table saw. 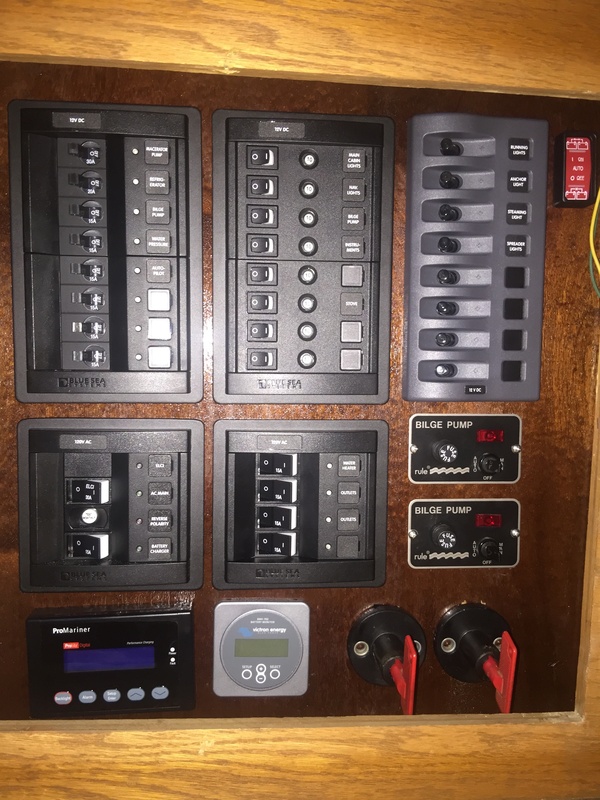 Finally I had to trace out each new panel, the main switches, the ACR override switch, bilge pump switches, battery monitor, and finally the remote display for the AC charger. I’ve graduated to the panel installation and routing wires to it through a series of harnesses. I’m not going to go OCD on the final routing but it will certainly be cleaner than the prior configuration and much easier to add another component. There are more important things to do than tweak the panel wires so they are all bundled perfectly. As long as chafe is minimized and it’s easy to navigate the wiring, that will be enough for me. 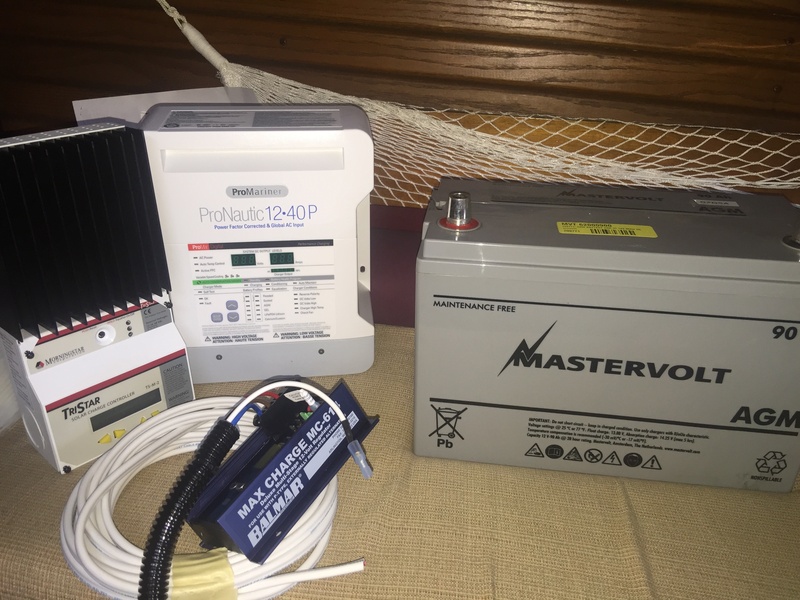 Once I have the new house batteries on the boat I can complete the project and add the new charging components. Phase three is adding the new battery bank and charging components, plus programming them for the proper charging voltage at each stage. My final post will cover these important steps. Satori came with a decent setup for keeping the batteries charged from both the alternator and battery charger. 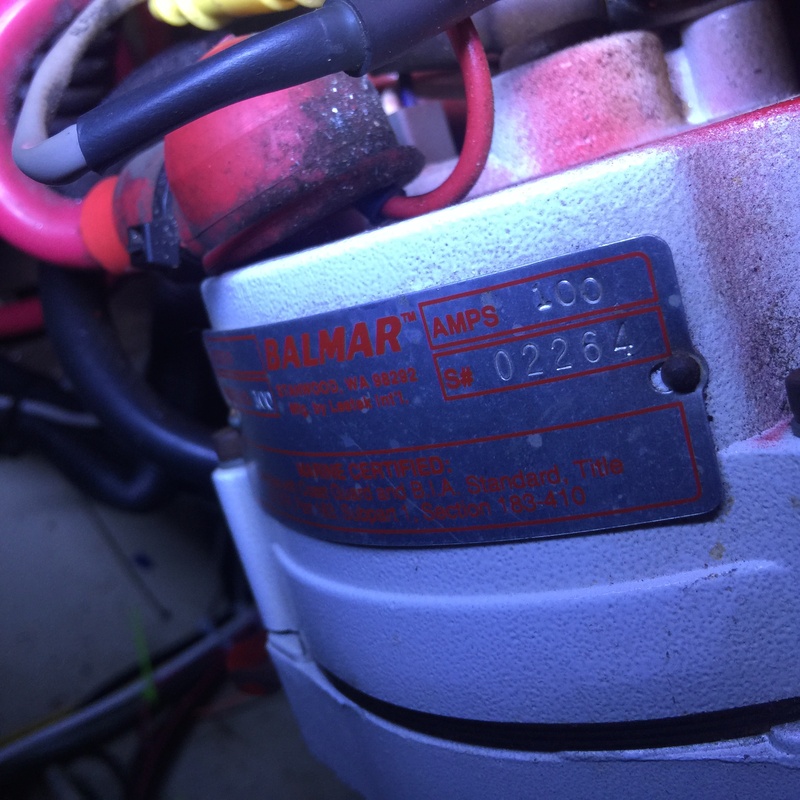 She has a Balmar 100 amp alternator plus regulator, and a 20 amp 110 volt charger. The problem I have is simply drawing too much from the small battery bank. Each light would consume over one amp of energy and the refrigerator draws a few amps while it is in it’s cooling cycle, but would run inefficiently from not sealing properly. For a modern tech guy the amount of available amps was not enough to satisfy the needs of the new captain and crew. At first I thought it would be a simple matter of adding a solar system to produce enough watts to fill up the batteries during the day and leave enough to use at night. I set out to find a way to install solar panels on the boat and first tried rigid panels on the stanchions. My frame idea ended up being a failed attempt but fortunately the panels turned out to be defective so I was able to swap them out for a set of flexible panels. Then it was just a matter of having enough canvas facing upwards or outwards to mount three hundred watts worth. This proved to be enough to keep the batteries charged to run the refrigerator and all other components full time during the summer months, when the sun is actually out. 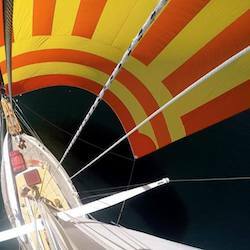 Once fall set in I was back to needing to plug in full time while at the marina to keep the system charged due to the lack of direct sunlight and also because I am flying a tarp which covers the solar panels to add more rain and wind protection over the companionway and cockpit. Being off grid is not really required during this time of year, while Satori is getting upgrades and not going anywhere. In order to be confident that she will venture into remote parts of the world without needing to consume gasoline to charge her batteries, she needs a better system. Not just a new charging system but also a new battery bank and wind generator. 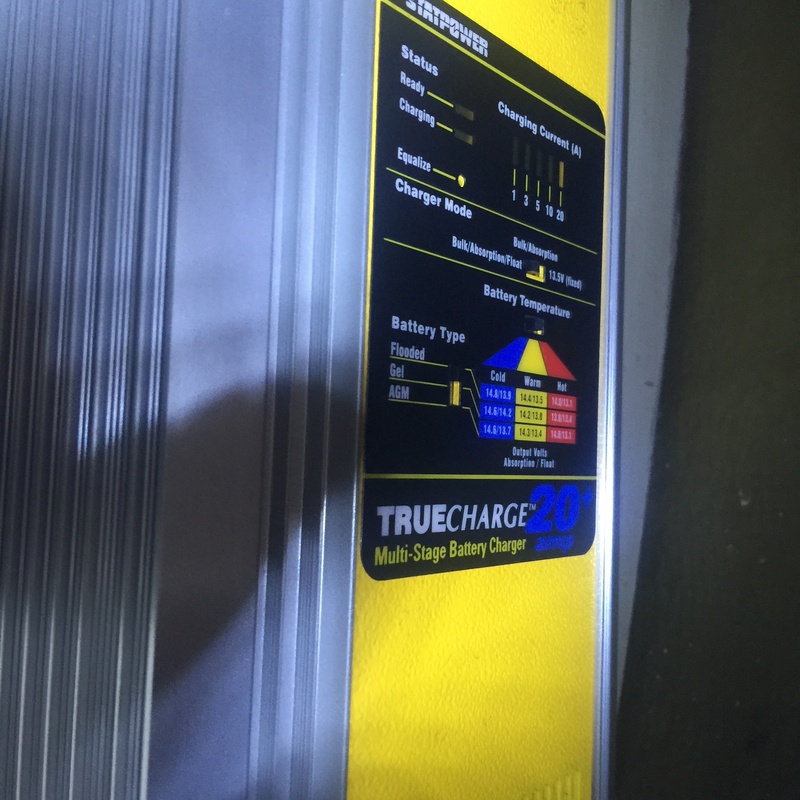 There are two flooded six-volt golf cart batteries and have a rating of 235 amp hours. This number is a little bit misleading because it assumes a discharge rate that would never work in the real world. To ensure that the voltage never drops past half of the battery’s capacity I would divide it into half. In other words, you cannot discharge more than half of the flooded battery’s capacity without risking long term damage to the battery. So I knew at the very best that the battery bank could deliver 117 amp hours and assuming a minimum average of three amps per hour at twenty four hours per day would be 72 amps per day. The reserve in the battery would be less than the daily average of required energy and the off-grid charging system could never keep up with this demand without lots of sunlight. There is no room for emergencies, nothing left to ensure that the batteries would last when the sun is gone and there isn’t enough fuel for the generator. The peak demand for me is close to 100 amp hours per day so it’s time to upgrade the system. Logically the best option for new batteries will be compact 12 volt AGM (absorbed glass mat) sealed batteries. I’ve decided that I will need a minimum of 300 actual (not rated) amp hours, plus a starting battery of at least 1000 cold cranking amps in case she ever has any issues starting and I need to crank long enough to get the engine started. To use AGM, I will need to replace all of the charging systems. That means the solar, engine and shore power chargers will need replacing. The automatic charging relay will need upgrading to handle AGM. I will also need to be able to program the chargers to handle exact voltages at each charging stage instead of depending on the factory settings of the chargers and regulators. Each of the chargers will need a remote battery temperature sensor to make sure that the battery bank temperature never reaches a critical point that may compromise the life of the battery. Each charging system will need to be programmable to set the voltage for each charging stage that meets the requirements of the battery, based on the manufacturer’s ratings. It’s very different than flooded batteries but the benefit will be a greater amount of available amp hours and a much faster charging rate, so batteries will be charged considerably quicker than flooded. Not to mention having newer and more dependable components. A breakdown of the old and new systems.. There are two important factors when choosing an AGM 12 volt system; remote battery temperature sensing and programmable voltage for each charging stage. Each battery manufacturer has a required voltage for bulk, absorption, finishing and float stages. Without these two critical parts the battery bank risks degradation at a much quicker rate. The benefits of AGM are no more lead acid potentially spilling out or corroding the contacts and a depth of charge at 80 percent of it’s capacity. There are several other benefits but these are my favorite. The battery system is likely to stay fully charged more often and can provide enough energy to keep up with the demands of living comfortably in a range of temperatures and conditions. Currently the biggest consumer of electricity is the refrigerator and toilet. The fridge is a necessity for long distance cruising and cycles on and off at a higher rate when the cabin warm up. The toilet usually never peaks above 10 amps and only runs up to ten times at two to three second intervals so it really only consumes a lot of amperes in a short period over a few amperes for a longer period. Both are very important because the first scenario requires a battery than can sustain a long period of draw whereas the other needs enough voltage to sustain the high bursts of energy draw. 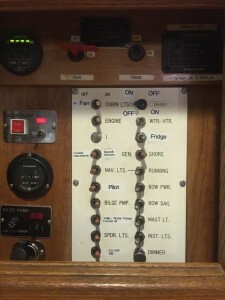 To obtain the system that meets the demands of myself and crew, I will be upgrading the charging system, the AC and DC circuits, batteries and much of the wiring. It’s a pretty large project but I am confident that I can complete it within a matter of weeks while taking my time doing everything right. I’ve spent the last couple of months doing an inventory, running calculations and building the upgrade path. Half of the path is circuit and the other is charging. I will be posting updates until the new system is in place and all components are wired, programmed and in service. 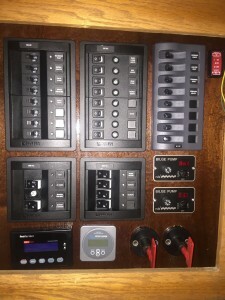 There is much to learn about marine electrical systems and once I have everything installed I think I will be ready to keep it in premium condition. Since last year I have managed to take the boat out. 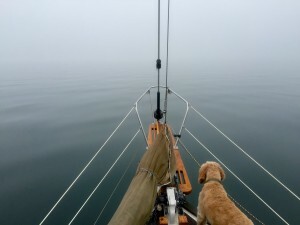 I flew the spinnaker on January 1st and then spent last weekend in Port Townsend. Although it’s middle of winter, the weather has been mild enough to enjoy some days out. 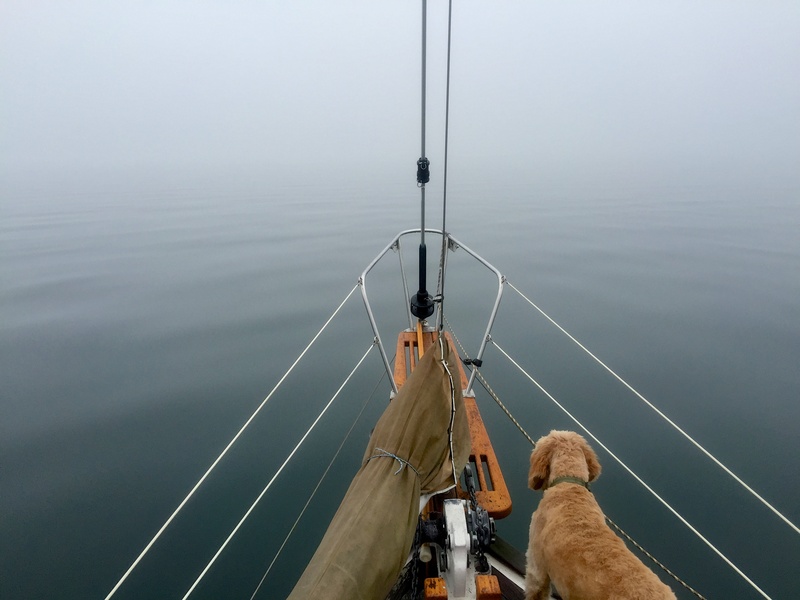 Showering in a warm and cozy cabin with hot water heated from the stove while baking a chicken in the stove’s oven adds a pleasantry that people do not usually achieve while at sea. I spend a lot of time at the dock so this is a perfect time for interior projects. The winter solstice has passed so we now ascend into better weather, longer days and more time spent outside.